The Zementis partnership with SAP is manifesting itself in a number of ways. 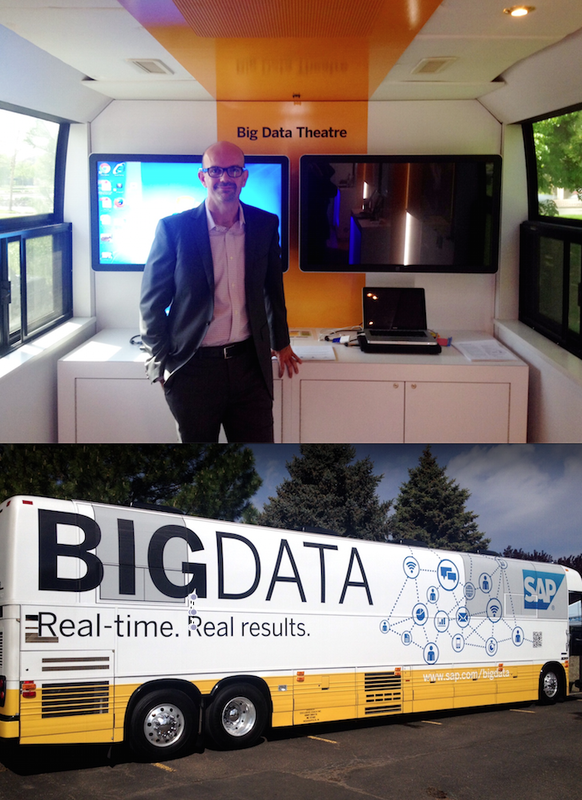 Two weeks ago we were part of the SAP Big Data Bus parked outside Wells Fargo in San Francisco. This week, we would like to share with you three new developments. 1) ADAPA is not being offered at the SAP HANA Marketplace. 2) An interview with our CEO, Mike Zeller, was just featured by SAP on the SAP Blogs. 3) Zementis was again part of the SAP Big Data Bus and the "Big Data Theatre". This time, the bus was parked outside US Bank in Englewood, Colorado. We were engaged in a myriad of conversations with the many people that came through the bus about how ADAPA and SAP HANA work together to bring predictive analytics and real-time scoring to transactional data and millions of accounts, in any industry. Visit the Zementis ADAPA for SAP HANA page for more details on the Zementis and SAP real-time solution for predictive analytics.